Kaohsiung Mayor Chen Chu is now in Seoul to promote tourism in South Korea at the head of a high-powered Taiwan mission accompanied by the city's economic affairs and tourism bureau chiefs. She hosted a reception at Seoul Plaza Hotel on Oct. 30 to congratulate the first charter of Mandarin Airline to Incheon, gateway to South Korea as well as to promote Kaohsiung in Korea, host city of the 2009 World Games. More than 300 local travel trade business leaders as well as media representatives joined the Kaohsiung's promotional event on Thursday. Also on hand at the function were Chen Yeong-Cho, Representative of the Taipei Mission in Korea, US Chung, former president of Korea Tourism Association. 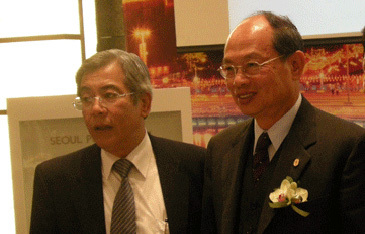 Hong Ki-jung, vice president of Modetour Co. and Seoul office director of Taiwan Visitors Association Wang Jen-Te. She flew into Seoul on Oct. 30 on board of a charter operated by Taipei-based Mandarin Airlines from the Kaohsiung International Airport to South Korea's Incheon International Airport outside Seoul. Mayor Chen has already visited Japan, Singapore and Hong Kong on tourism promotion missions this year. 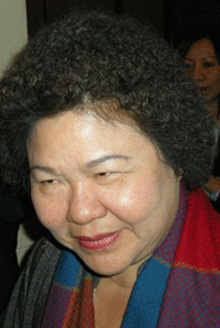 She is scheduled to pay a visit to Busan, the southern port city of Korea and to meet with the country's second largest city's Mayor Hur Nam-sik. Meeting with South Korean travel trade business leaders, she expressed hope that her visit could help create more business opportunities for Kaohsiung City's tourism sector. South Korean tourists made about 21,000 visits to the port city in southern Taiwan in the first nine months of this year, up from the previous year's level of 16,000, the mayor said, citing statistics compiled by the city government. For the 2009 World Games, Kaohsiung has designated 24 games arenas. Many of the locations are well-known to Kaohsiung residents and are even landmarks in their own right. 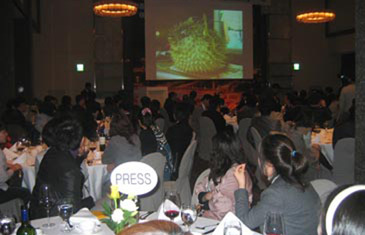 The reception opened at Seoul Plaza Hotel on Oct. 30, 2008. "The success of the World Games will bring glory and honor to the City of Kaohsiung and it will ensure Kaohsiung's status as a host of large-scale, international events," she said. In the meantime, the orange line of Kaohsiung MRT is commissioned early than expected this month with no concern for safety, it was learned. Taiwan's Mandarin Airlines launched its first Kaohsiung-Seoul direct charter flight at the end of October and begin regularly scheduled service on the route starting in December. Paul T.T.Yang, general manager, Korea Ranch Office of China Airlines said that Mandarin Airlines' new flight service will provide convenience and save time for passengers traveling between the Taiwan ‘s southern city and the Korean capital. Taiwan's Uni Air had offered regularly scheduled service between the two destinations, but canceled the route Aug. 15. Mandarin Airlines' first charter flight departed from Kaohsiung International Airport Oct. 29, and the returning flight took off from Seoul's Incheon International Airport the next day. The company said that it will fly two charters a week serving only tour groups between Oct. 29 and Nov. 30, but will expand that to four regularly scheduled flights a week, beginning Dec. 1, that will be open to all travelers. Several domestic travel agencies will collaborate with the airline in organizing group tours to Seoul during the charter period, the carrier said. China Airlines, Mandarin Airlines' parent company, also noted that it will craft short-term theme tours in Korea to coincide with the new link. China Airlines said the new route reflects its emphasis on the southern Taiwan market, following an increase in flights between Kaohsiung and Manila Oct. 1. Mandarin Airlines was established on June 1, 1991 and was originally a joint venture of China Airlines and the Koos Group. The Chinese name of Mandarin Airlines was therefore created as a synthesis of characters from both investors. In the beginning, Mandarin Airlines mainly operates direct flights from Taipei to Canada's Vancouver, Australia's Sydney and Brisbane. From the very beginning, Mandarin Airlines emphasized on flight safety and comfortable flight service. It received the 1992 citation of meritorious service from the Australian Civil Aviation Board in 1992. In April 1996 we were granted the first ISO-9002 certification for service in Taiwan. This certification includes flight operation, maintenance operation, flight safety, operational control, passenger service, ground handling and cargo service. This certification has been renewed on December 2003, Mandarin Airlines has been awarded with ISO9001 year-2000-edition certificate. The meaning of this certification is aim at providing unanimous operational and service standards through internal quality control and customer communication to achieve service improvement and customer satisfaction. The golden eagle Hai Tung Ching from old Chinese legend was chosen as the business mark of Mandarin Airlines when the airline was first formed. "We are committed with an attentive, caring, and pragmatic attitude to provide safe, economic, and efficient service to our customers," said Mr. Yang.